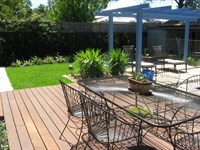 Winstanley Landscapes has been building quality landscape projects in Melbourne for over 26 years. Over that time the team has won numerous awards at both Victorian and National Level. Our managing director, Bruce Winstanley has been an active member of Landscaping Victoria for many years, having served as a past President and Treasurer of the Association. Bruce was made a life member of Landscaping Victoria in 2016 for his contribution to the landscaping industry through his 21 year membership of the association. As Licensed Registered Builders in the fields of Landscape Construction as well as Concrete Swimming Pool Construction we can provide you with 'peace of mind' that we have the required expertise to build you a longlasting and aesthetically pleasing landscape project. As you would expect, we have the required insurances, registrations and warranties to ensure that all constructions at your property are completed professionally and legally. As with swimming pool construction, it is essential that a landscape design is completed before any construction is commenced. We have relationships with experienced designers who can provide working drawings to ensure that the project can be planned and executed to everyone's expectations. Having invested in a beautiful landscaped garden with plants and lawns, they will need to be maintained to reach their full potential. Dependent upon your requirements, we can formulate a garden maintenance program to suit your needs and protect your investment. A great landscape starts with a great design. 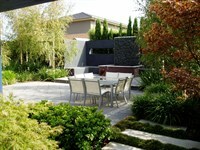 David Bennett of Gardens and Pools by Design has designed many of the award winning landcapes we have constructed over the years. David's attention to detail and his ability to listen to your ideas enables him to turn them into a design that is both beautiful and suiting your needs.